What is canine elbow dysplasia? The word “dysplasia” means “abnormality of development”. The elbow is a complex joint because it involves the articulation of three bones. If the three bones do not fit together absolutely perfectly as a result of abnormal development, the consequence is abnormal concentration of forces on a specific region of the elbow joint. Forms of primary cartilage disease may also constitute abnormal development of the elbow joint resulting in significant clinical consequences. 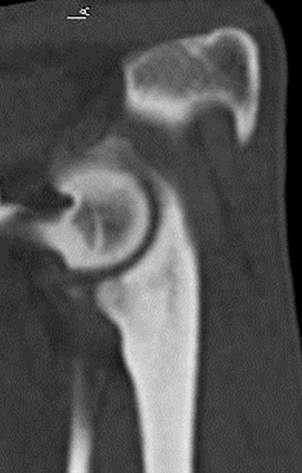 The term ‘developmental elbow diseases’ may be a more descriptive nomenclature for this condition since most people will have heard of ‘dysplasia’ only in reference to the hip joint. Elbow dysplasia and hip dysplasia both mean that the conformation of the joint is abnormal. In hip dysplasia, the end result of the abnormality in all dogs will be osteoarthritis accompanied by pain and reduced range of motion. 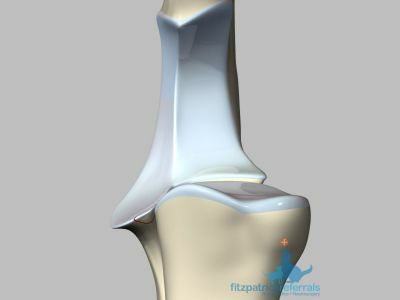 Treatment mostly consists of management of the osteoarthritis or joint replacement. 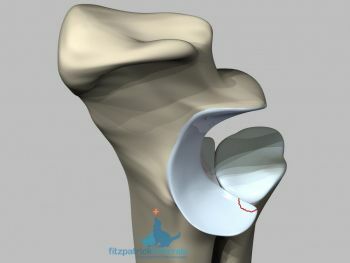 In elbow dysplasia, the forces concentrated on specific areas of the joint will not only result in osteoarthritis (as happens with hip dysplasia) but also in discrete pathological entities like fractures within the joint that may need to be managed separately and alongside the osteoarthritis. Until recently it was believed that these disease entities were the manifestations of different elbow pathology but as they were commonly seen in combination with each other and they all resulted in elbow osteoarthritis, the term elbow dysplasia was used as an umbrella term for all of them. We now believe that these disease entities are the manifestation of the same pathology, which is the abnormal conformation of the joint and therefore we often see them in combination with each other. Although we still use the term elbow dysplasia to describe them, this term is now mostly used to describe the main pathology and not as an umbrella term for different joint disease entities. How can I tell if my dog has elbow dysplasia? Video 1 from Fitzpatrick Referrals on Vimeo: This is a pronounced head nod typical of a dog with elbow origin lameness. Elbow dysplasia is the most common cause of forelimb lameness in young, large and giant breed dogs. Most dogs have a limp on one or both front legs. This can be seen as a nodding of the head when the good leg is placed and lifting of the head when the bad leg is placed. Some dogs that limp on both front legs will not have a limp, but will have an unusual “paddling” gait. Lameness is often triggered by prolonged rest and exercise. For this reason, many dogs will be lame when they wake up but after a warm up they will exercise freely and limp again afterwards. Although most dogs will be diagnosed before they are two years old, some dogs will not limp until they are older. Collectively, elbow dysplasia and elbow osteoarthritis are the commonest causes of forelimb lameness in dogs of any age. Small dogs can also be affected by elbow dysplasia and this problem should be suspected in any dog with forelimb lameness that has not been caused by trauma. What is the cause of elbow dysplasia? 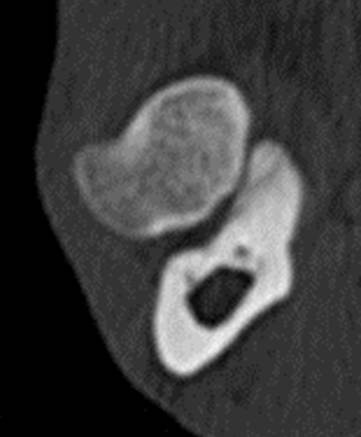 Figure 1: This image shows the pattern of stress fracture radiating from part of the coronoid process of the ulna. Picture 2: This is a microscopic image of a crack forming beneath the surface before it is visible at the surface. Fitzpatrick Referrals were responsible for the landmark research that showed that medial coronoid disease began in the bone beneath the surface and was not primarily a disease of cartilage. 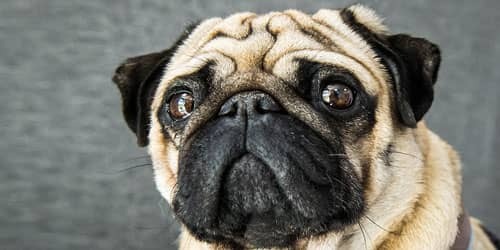 This condition is primarily of genetic cause although environmental factors, such as obesity during puppyhood, may influence whether an animal with the genes coding for elbow dysplasia will develop a clinical problem. Current estimates state that more than one hundred genes code for elbow dysplasia. Our ultimate goal will be to genetically map affected animals and tailor breed programmes to minimise this disease. Video 2 from Fitzpatrick Referrals on Vimeo: Microcracks coalesce to form visible cracks in the coronoid process much like an earthquake as in this video. In most dogs affected by elbow dysplasia, the pathology involves concentration of abnormal forces on a part of the joint called the coronoid process of the ulna. These abnormal forces cause microscopic stress fractures within this process, resulting in pain and lameness. In many dogs, either a small portion of the process or the entire process, will separate from the remaining bone. This problem is called fragmented coronoid process (FCP) and is one of the disease entities accompanying elbow dysplasia. Whilst standard radiographs are very helpful in diagnosis of this condition, CT can provide more specific information regarding the “fit” of the bones and regarding subtle bone pathology below the cartilage. 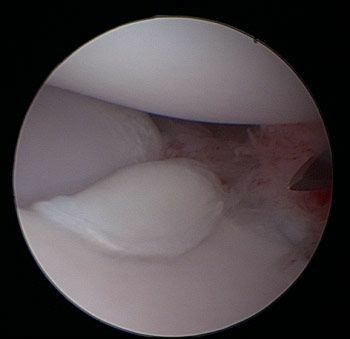 Arthroscopy can provide additional information regarding the joint surfaces which, in combination with the findings from radiography and CT, will allow efficacious treatment. 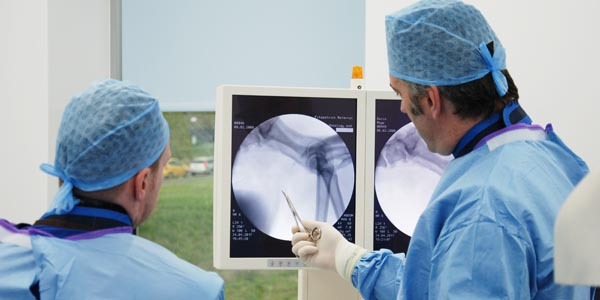 Investigation of the joint with radiographs and/or CT and subsequent arthroscopy is considered the standard of care at Fitzpatrick Referrals. Elbow incongruity can be transient or permanent. Subtle differences in the growth rate of the two bones that make up the forearm (the radius and ulna) can cause severe overloading of the prominent coronoid process of the ulna. In some dogs, it may be that this incongruity has resolved by the time the diagnosis of elbow dysplasia is made, but the consequence of this transient incongruity is stress fracturing of the coronoid process. 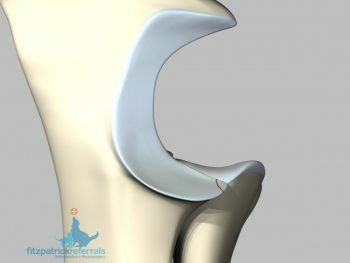 Treatment of this problem is usually by arthroscopic fragment removal or subtotal coronoid ostectomy. With the latter, not only do we remove the fragmented coronoid process but also some of the unfragmented part which could still contribute to joint pathology due to its abnormal conformation and ongoing inflammation. In elbows, in which this type of incongruity is permanent, treatment is usually accompanied by proximal ulnar osteotomy in an effort to allow the longer bone (ulna) to find a more “convenient” place in the joint. Video 3 from Fitzpatrick Referrals on Vimeo: Short radius syndrome. In some affected elbow joints, stress fractures of the coronoid process of the ulna could be the consequence of repetitive impact from the adjacent radial head. The anatomical structure with most contribution to this repetitive impact is a branch of the biceps tendon. This could be because every time the biceps muscle contracts it causes the radius to impact the ulna around an area known as radial incisure of the ulna (incisuar radialis ulnae). Treatment of this problem may be undertaken by a surgical procedure called ‘biceps ulnar release’. In some cases, the notch of the ulna is excessively elliptical or simply the wrong shape relative to the humerus, resulting in severe overload of the extremities of the notch. In some dogs, this can cause severe cartilage erosion. When this happens, treatment options depend on the disease entities accompanying the developmental disorder and the extent of osteoarthritis present. What is the long-term consequence of elbow dysplasia? Video 8 from Fitzpatrick Referrals on Vimeo: Even if the fragment is removed, sometimes the humerus continues to rub on the ulna, much like a break on a break-pad in a car, if the humero-ulnar joint is incongruent. Every dog with elbow dysplasia is affected by some degree of elbow osteoarthritis at the time of diagnosis. This can be the consequence of a loose fragment acting like a “stone in a shoe” within the joint or of untreated elbow incongruity such as radio-ulnar or humero-ulnar conflict. Surgical treatments for elbow dysplasia aim to treat the current source of pain and also to minimise the likelihood of osteoarthritis progression. Non-surgical treatments for elbow dysplasia aim to treat elbow pain and maintain mobility but do not have the potential to minimise osteoarthritis progression. Rehabilitation of elbow dysplasia can be provided through our rehabilitation service whereby one of our chartered physiotherapists will design a home care physiotherapy and exercise plan for you to follow at home between outpatient physiotherapy and hydrotherapy appointments. The clinical impact of elbow osteoarthritis is unpredictable and, regardless of treatment, arthritis will progress to some extent for all affected joints. In some dogs, lameness can be mild and intermittent, whilst in others, lameness can cause severe and permanent disability. Where persistent cartilage erosion occurs, it is generally in the inner (medial) part of the elbow, constituting the joint between the humerus and the ulna (coronoid process). This could be the result of any form of elbow incongruity, such as a short radius, an abnormally shaped ulnar notch or just abnormal three-dimensional rotation conflict. In these situations, depending on the degree of poor fit, surgical treatment could include proximal ulnar osteotomy, sliding humeral osteotomy, canine unicompartmental replacement or total elbow replacement. How is elbow dysplasia diagnosed? At home, you will have noticed lameness or stiffness and your primary care vet will have noticed elbow pain in your dog. 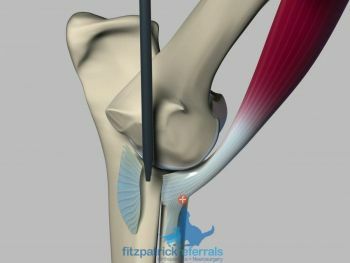 During your consultation at Fitzpatrick Referrals, one of our orthopaedic clinicians will perform a thorough, clinical examination to isolate definitive pain to the elbow and will discuss further investigation requirements and possible surgical intervention options should they be indicated. 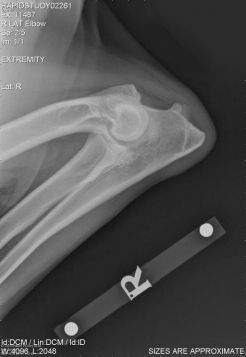 If your primary care vet had a suspicion of elbow dysplasia, they may have obtained radiographs of the elbow joints. Radiographs will usually show changes in affected dogs although this is not always the case. At times, changes can be very subtle and difficult to detect and therefore the position in which the elbow is placed and the type of radiograph taken will have a great bearing on the ability to perceive pathology. 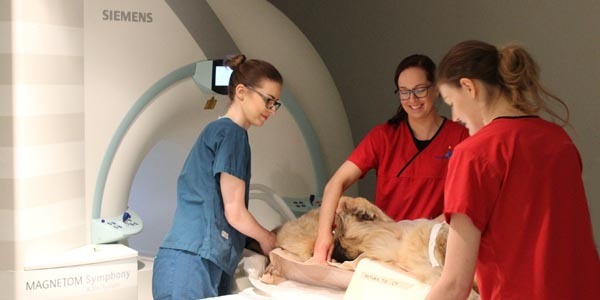 At Fitzpatrick Referrals, our advanced diagnostic imaging service has the most advanced direct digital radiography yielding crystal clear images to optimise diagnostic opportunity including more advanced imaging techniques such as CT and MRI. Pictures 5 and 6: These two images are appropriately positioned medio-lateral flexed images of the elbows of two young Labrador retrievers. The first image shows new bone formation and increased whiteness under the ulnar notch (known as sub-trochlear sclerosis, STS) and as such it s easy to see the osteoarthritis. In the second image however, there is only subtle STS and therefore medial coronoid disease could easily be missed in this dog. 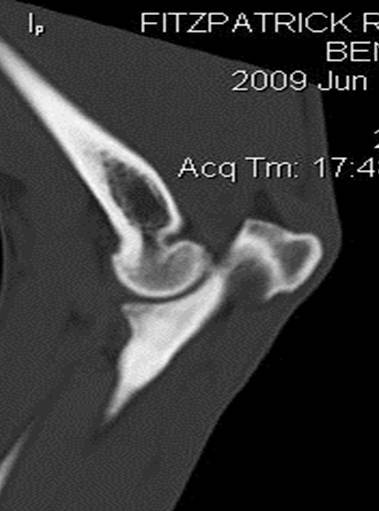 In addition to radiography, we use computed tomography (CT) and arthroscopy to facilitate diagnosis of elbow dysplasia. CT can be performed under sedation or general anaesthesia. It is a very sensitive method for the diagnosis of stress fracturing of the coronoid process of the ulna and for the assessment of elbow incongruity and the bone underneath the cartilage. 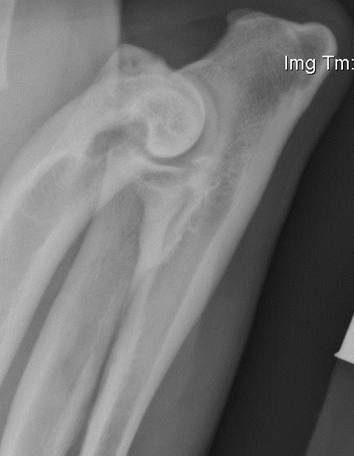 CT gives us very useful information for planning the best treatment of elbow dysplasia in your dog. 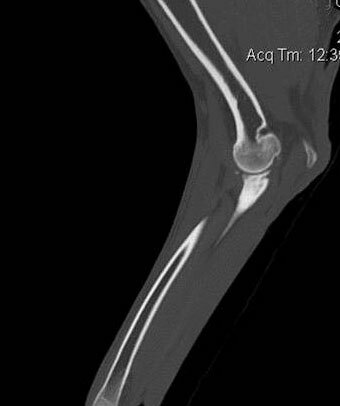 We offer CT to most cases when elbow dysplasia is suspected. The entire study can be completed in minutes and gives us a three-dimensional picture of the disease process. Pictures 7 and 8: These images represent sagittal and transverse planar images of fragmentation of the medial coronoid process clearly visible on a CT scan. Pictures 9 and 10: These images represent sagittal and transverse planar images of fragmentation of the medial coronoid process from the Labrador Retriever for whom the second radiograph above was taken. 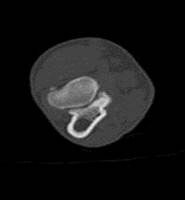 It s clear that though the fissuring is impossible to see radiographically, its clearly evident on the CT scan images. Pictures 11,12 and 13: This series of images also show radiography and CT scan from the same patient. Again it s clear to see that the radiograph simply shows STS whilst the CT scans show obvious fragmentation. It s important to realise that radiographs alone are sentinel for disease of the coronoid process and that other imaging modalities may be necessary for definitive diagnosis. 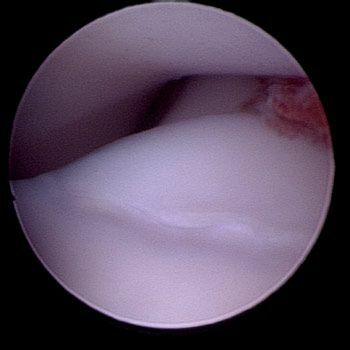 Arthroscopy is the gold standard technique for diagnosis of problems within a joint. It is a keyhole surgical technique that is performed under general anaesthesia. 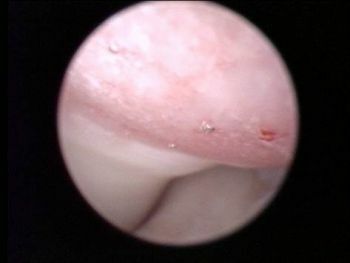 Arthroscopy allows us to obtain a magnified panoramic view of the inside of a joint. In dogs requiring treatment of problems in both elbows, arthroscopy and surgery are performed as part of a single surgical procedure under the same general anaesthetic. When resolution of the problem can be arthroscopically achieved, your dog will generally be walking well the following day and recovery times are usually rapid. Noel performing elbow arthroscopy. It is necessary to dim the lights so the surgeon can have optimum visualisation of the images of the inside of your dog’s elbow. Pictures 14, 15, 16 and 17: these pictures illustrate tip and radial incisure fragmentation of the medial coronoid process, which are the two most common kinds of fragmentation. The arthroscopy images are accompanied by schematic representations to illustrate the two patterns of the disease. It’s important to realise that these two forms may require different treatment and at Fitzpatrick Referrals, we have pioneered research designed to optimise the most appropriate treatment for each individual patient. How is elbow dysplasia treated? Non-surgical therapies may be a preferable management option for some dogs with elbow dysplasia and osteoarthritis. We are proud to offer an Osteoarthritis Clinic, which provides comprehensive non-surgical management of osteoarthritis and complements the surgical expertise already in place. The traditional cornerstones of non-surgical treatment are body weight management, physiotherapy, exercise modification and medication (anti-inflammatory painkillers). We also offer regenerative medicine therapies such as stem cells and platelet-rich plasma to help combat the pain and inflammation associated with osteoarthritis, and are working hard to provide useful outcome data, as publications are currently lacking in this area. 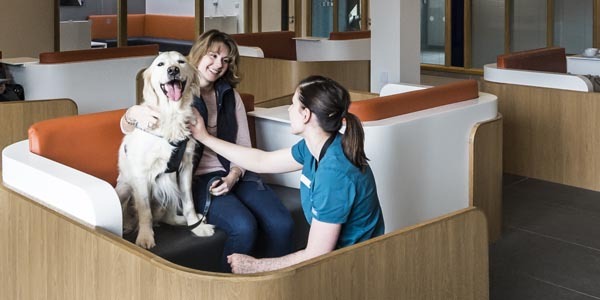 At Fitzpatrick Referrals, we have a team of chartered physiotherapists and hydrotherapists formulating protocols for treatment of all forms of joint disease, including those patients not surgically treated and for postoperative rehabilitation of surgical patients. The protocols are custom-designed to your dog to optimise outcomes. 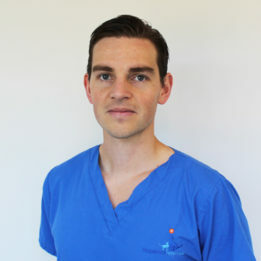 Physiotherapy will not cure any arthritic changes in the joint or remove pain on its own, but it can significantly help mobility and improve function for arthritic joints, and it can significantly improve outcomes achieved after surgery. In some cases, the problem at the time of diagnosis is confined to an isolated fragment of the coronoid process of the ulna. 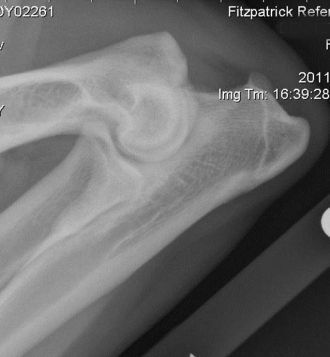 In dogs having arthroscopic fragment removal alone, the CT scan and arthroscopy will have shown no evidence of current elbow incongruity or radio-ulnar conflict, and any remaining coronoid process will have been assessed as having a low risk for stress microfracture. The majority of dogs will make a rapid clinical improvement after arthroscopic fragment removal, and in some cases this improvement will be maintained in the long-term. The long-term prognosis is dependent on the degree of osteoarthritis in the remainder of the elbow joint and this is discussed by your orthopaedic clinician on an individual basis. In some cases, we recognise a specific pattern of stress fracturing of the coronoid process of the ulna typical of radio-ulnar conflict. This conflict is contributed to by excessive and repetitive forces imparted by one of the branches of the biceps muscle which attaches on the coronoid process itself. Although the tendon itself is not diseased, it exerts force on a badly fitting bone geometry which contributes to the micro-fractures and ultimate fragmentation. 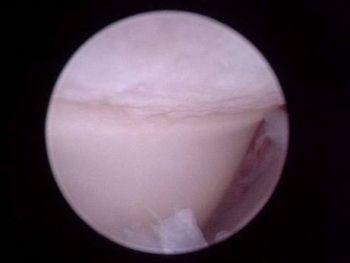 Arthroscopic surgical release of this branch allows neutralisation of these forces. The remaining biceps insertion on the radius is not affected, and because the biceps shares its function of flexing the elbow joint with another muscle (the brachialis), there is no deleterious mechanical consequence of biceps ulnar release. This procedure was also pioneered at Fitzpatrick Referrals. Pictures 20 and 21: Biceps ulnar release involves sectioning of the part of the biceps tendon that is contributing to repetetive imaction of the radial head against the coronoid process of the ulna. This procedure can be performed arthroscopically as shown here. In elbows where there is diffuse stress fracturing of the coronoid process of the ulna, the majority of the process should be removed using arthroscopy. 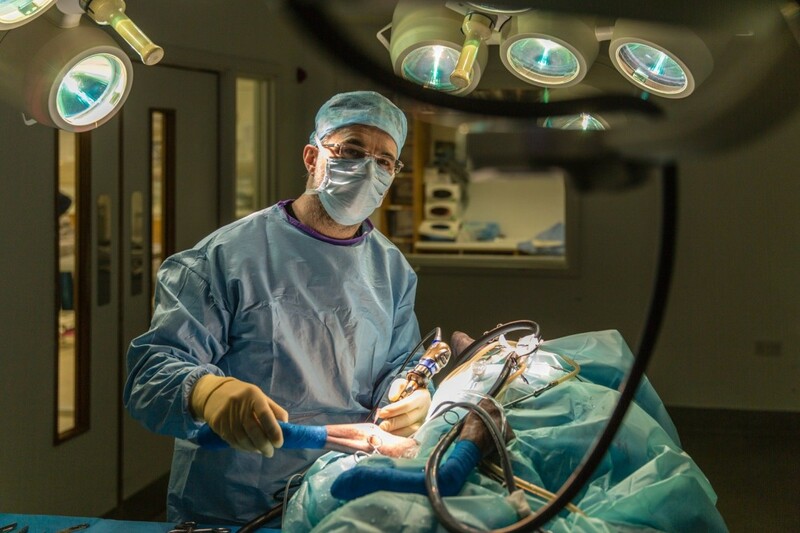 This particular surgery was developed at Fitzpatrick Referrals. In common with arthroscopic fragment removal, the majority of dogs will make a good clinical improvement after SCO and in many cases this improvement is maintained in the longer term. However, osteoarthritis is progressive for all forms of medial coronoid disease regardless of whether fragment removal alone or SCO is performed. In many cases however, this does not produce noticeable lameness and rehabilitation of osteoarthritis advice can be provided by our chartered physiotherapists. Video 9 from Fitzpatrick Referrals on Vimeo. In some elbow joints, stress fracturing of the coronoid process of the ulna is caused by the presence of a relatively short radius, and this incongruity can be permanent. In these elbows, the incongruity is corrected in order to treat the current elbow pain and also to attempt to limit the future progression of osteoarthritis. This is achieved by cutting the ulna below the elbow joint. Cutting the bone at this point does not prevent the limb from being used normally and healing of the bone occurs in a new position that provides a more congruent elbow joint. 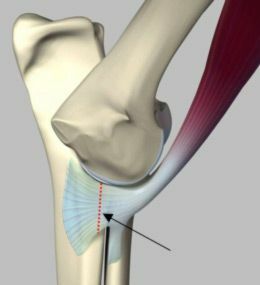 The same technique may be employed to treat elbows affected by a poor fit between the humerus and the ulnar notch. Appropriate motion of the cut portion of the ulna and subsequent healing is facilitated by a specific angle of cut termed ‘dynamic oblique’. 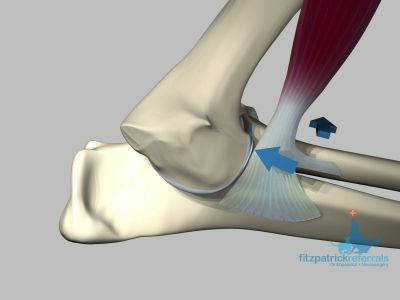 The specific nature of this technique was established by Fitzpatrick Referrals. Picture 19 and video 10: This image and video represents the effect of a bi-oblique dynamic proximal ulnar osteotomy on the medial coronoid process. PAUL surgery falls into the group of surgeries called load-altering osteotomies. An osteotomy involves a controlled surgical cut of a bone. The PAUL osteotomy procedure involves an ulnar osteotomy which is secured with a plate and screws to stabilise the bone while it heals in the new position. The surgery aims to unload the medial compartment of the elbow, thus reducing pain and improving limb use and function. In some dogs with advanced elbow dysplasia, there is severe secondary osteoarthritis. A specific pattern of osteoarthritis, in which cartilage is severely damaged or absent on the medial (inside) aspect of the joint but appears relatively healthy on the lateral (outside) aspect of the joint, can be treated by SHO. This type of elbow pathology is known as medial compartment disease (MCD). SHO is an advanced procedure that is currently offered in only a few veterinary hospitals worldwide. It involves cutting the humerus (upper arm bone) and fixing it in a new position using a special stepped bone plate and screws. This transfers weight away from the diseased medial joint to the healthier lateral joint. In young dogs, there is the potential for some cartilage regeneration in the medial compartment after SHO. This isn’t normal functional cartilage but serves as evidence of unloading and a decrease in pain associated with friction between the humerus and the ulna (humero-ulnar conflict). 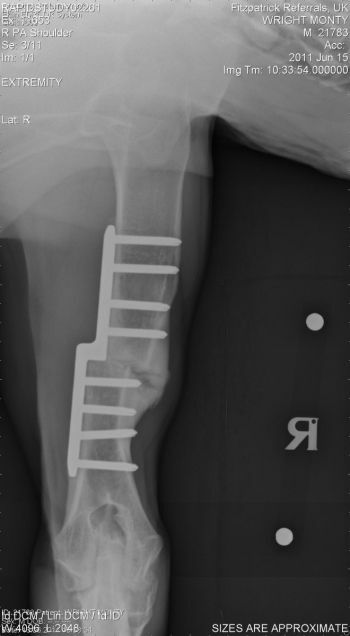 The original SHO technique was refined by Noel Fitzpatrick and the surgery now uses custom-made implants which are manufactured to fit the exact dimensions of the patient’s bone. Shows a typical elbow which may be treated in this fashion (with clearly evident full thickness cartilage erosion of the medial compartment); the fourth shows another elbow with no cartilage on the medial aspect of the distal humerus and the fifth image clearly shows fibrocartilage ingrowth several months later, demonstrating that the medial aspect of the joint has been unloaded and the patient is in considerably less pain. CUE is an alternative to SHO in selected, mature dogs suffering from medial compartment disease. This advanced surgical procedure involves the resurfacing of the weight-bearing portion of the medial (inside) elbow where cartilage is absent. In some dogs, elbow osteoarthritis can be extremely severe, with little or no healthy cartilage remaining. In these dogs, TER is used as a salvage procedure i.e. it is performed as a last resort where other treatments will be ineffective. The entire elbow joint surface is replaced with a custom elbow prostheses. Currently, we are one of the few practices in the UK able to provide this procedure.